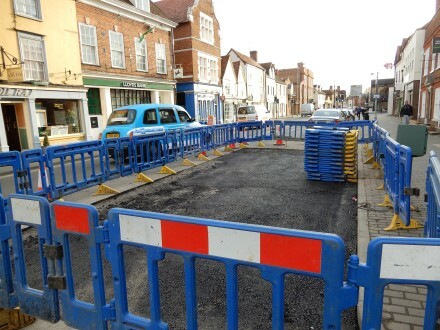 There was a further attempt today to mend the water leak that has been causing a problem in Ock Street since Mid March. The hole was bigger this time, and now that it has been filled I can see no sign of gushing water. There is another hole between Stratton Way and Bath Street where there is usually a raised bed of flowers. 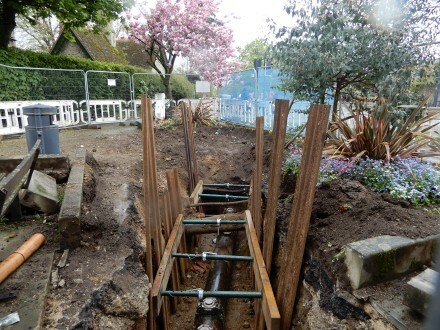 This is part of new gas mains being laid. Four weeks after Easter I am still finishing eating my chocolate eggs and I am thinking how lucky I am to be in Abingdon. The Local Excellence and Craft Markets inspire you to be creative with gifts for friends and family. There are the array of both independent and larger retail shops. Then the cafes and pubs offer the opportunity of spending time with loved ones. This Easter I was lucky enough to get organic Fairtrade chocolate eggs from the Cooperative, tea leaves from Added Ingredients, and a gift voucher to be used at Utopia on Stert Street. Whilst eating my chocolate eggs I thought of their continuing significance in many different cultural contexts both in the Pagan and Christian traditions, symbolising new life, fertility and rebirth and the germinating of life that is early spring. Whatever belief system you follow Spring is an opportunity to start afresh and remind yourself of the transformative power of the human spirit as seen through the actions of local people in Abingdon without whom our communities would not exist or thrive. 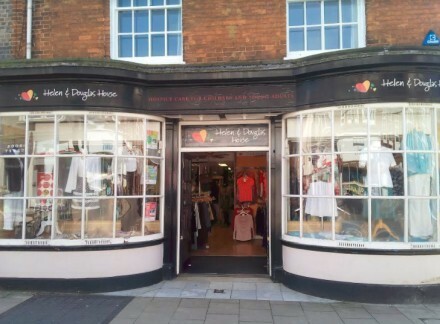 Helena and her team of willing volunteers have run the Helen Douglas Charity shop for over 12 years. 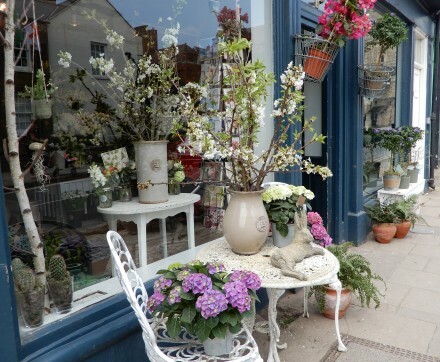 They always bring a smile to your face when you walk into the shop and the team effort is evident in their beautiful window displays which both attracts customers and gains recognition in the awards at the Extravaganza each year. 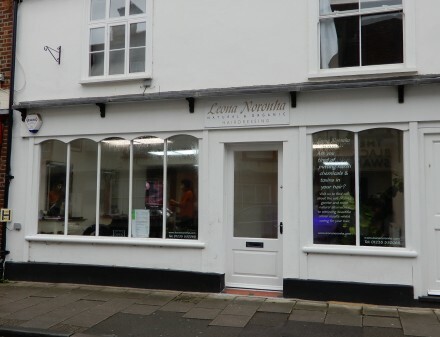 A visit to Leona Norhana’s organic hairdressing salon on Bath street leaves you feeling radiant in more ways than one. Her products are derived from ethical and sustainable sources and Leona’s empowering advice and mentoring of women in all walks of life makes you wonder whether she has done a course in life coaching alongside her obvious salon skills. A short walk away from the centre of town in North Abingdon live an amazing couple who exchange more Easter eggs and presents then any couple I know. Rod and Rosily Hudson have been fostering and adopting children in the Abingdon community for over 40 years now. They are in their 70s and continue to foster children in need of emergency care during the holiday periods. They are so inspiring. 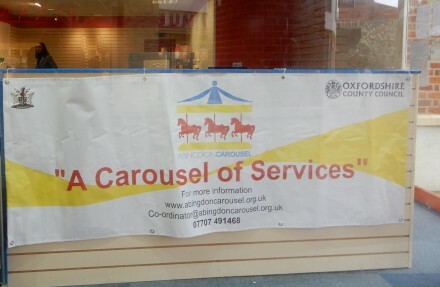 Abingdon Carousel have been at the Abingdon Free Space in Bury Street this week. They are the new charity that will be putting on services at the Carousel Family Centre in South Abingdon, taking over part of the former Children’s Centre. 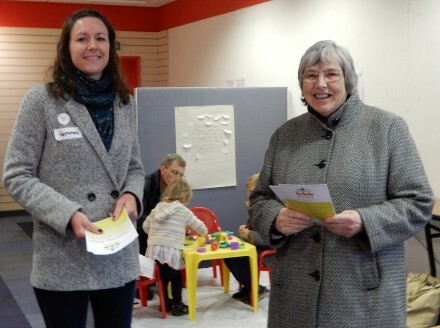 So this week they had play things for children in the Free Space and information for adults. Gemma has been appointed Service Co-Ordinator and will be leading the establishment of family services in the former Abingdon Children’s Centre building. Lesley Legge is one of the trustees of the new charity. They need volunteers to help with all kinds of tasks, from fundraising to painting, from administration to reception duties. You can express an interest at www.abingdoncarousel.org.uk. They have financial support from Oxfordshire County Council, Abingdon-on-Thames Town Council, and Christ’s Hospital of Abingdon. 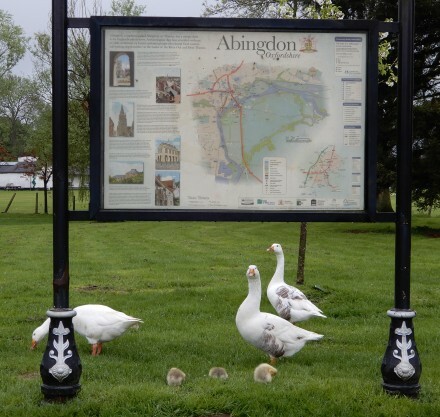 This group of goslings, with some older geese, were under the Abingdon Map beside the River Thames this evening. 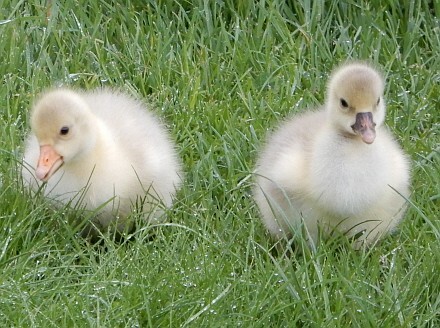 The goslings looked very young but were already able to walk, and swim, and eat grass. They will be much better off if they are just allowed to eat grass – NOT given bread which is to them a junk food. We humans can get away with eating junk food now and again, but baby birds grow up much quicker and so for them a natural grass diet will make them strong and healthy. Bread won’t. 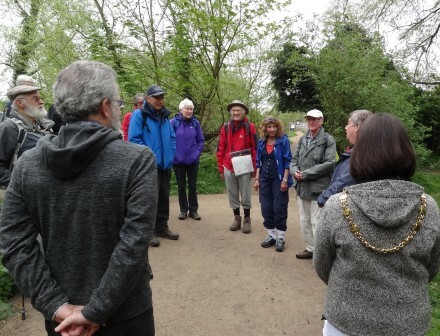 The Vale Way walking trail was launched on 3rd July 2015 by the mayor, Helen Pighills. 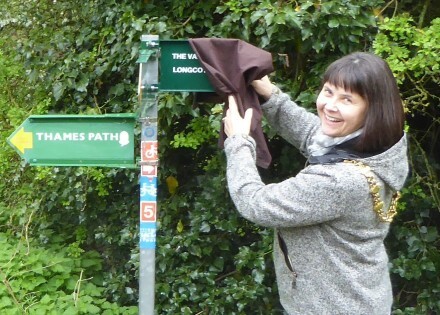 Since then the local Ramblers group have waymarked the route by adding small blue decals with the words ‘The Vale Way Ramblers’ to existing way mark signs along the way. Last year the route was accepted for inclusion on Ordnance Survey mapping. Currently available on online maps, we await being able to purchase paper maps with the route shown. This year the Ramblers have funded two metal finger post signs to mark the two ends of the trail. The sign at the eastern end of the trail was installed on the post at the junction with the Thames path adjacent to the bridge over the millstream near Abingdon weir on Tuesday 24th April 2018. The sign was officially unveiled by the Mayor of Abingdon on Thames, Cllr Jan Morter. A sign at the western end of the route will be installed and unveiled in late May. 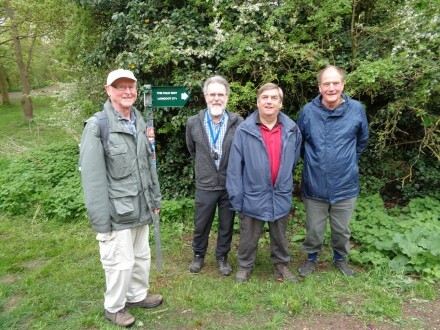 The Vale Way team left to right are Stuart Hughes, John Gordon, Peter Skuse, Jim Parke. The route is divided into 5 shorter sections with instructions given for each section. Generally start and finish points can be accessed by buses. Please enjoy our wonderful Vale countryside and historic market towns and villages.